Home / Analysis / Muhammed Hussain / Who was Hussain and what is Ashura? Who was Hussain and what is Ashura? No mainstream TV channel or newspaper has ever accurately informed the public of what happened on Ashura and what the message of Hussain actually is. Ashura is the 10th day of the first month of the Islamic calendar (10 October 680AD). This year it was on October 24th when millions of people worldwide commiserated the martyrdom of Imam Hussain (the second grandson of the Prophet of Islam) and his companions, including his family members. He was killed by the forces of Yazeed. So what was the message of Hussain? The best way to understand of what the existence of Hussain manifested and his message is to look at the people who were directly inspired by him. Mahatma Ghandi (political and spiritual leader) said, “I learned from Hussain how to achieve victory while being oppressed”. It’s also noteworthy to mention that Martin Luther King and Nelson Mandela were inspired by Ghandi to fight against injustice and oppression peacefully. Edward Gibbon (English historian and Member of Parliament) wrote, “In a distant age and climate, the tragic scene of the death of Hosein will awaken the sympathy of the coldest reader.” (The Decline and Fall of the Roman Empire, 1911, volume, 5, p.391-392). From the aforementioned quotes, it’s very obvious why some oppressive regimes and media platforms are trying ban or distort the message of Hussain. The reason is clear; because, Hussain stood against tyranny, injustice, greed, oppression, inequality, discrimination and racism. However, it is impossible to ban the remembrance of Hussain in any shape or form due to the huge masses of people upholding this message – even 1376 years after the tragic event. Every year, forty days after the day of Ashura, an estimated 20-25 million people gather in Karbala, Iraq, from all over the world, to commemorate Arba’een. 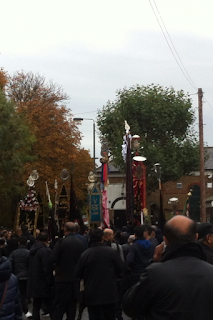 A day to bid farewell to Hussain.